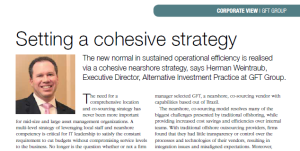 The new normal in sustained operational efficiency is realised via a cohesive nearshore strategy, says Herman Weintraub, Executive Director, Alternative Investment Practice at GFT Group. The need for a comprehensive location and co-sourcing strategy has never been more important for mid-size and large asset management organizations. A multi-level strategy of leveraging local staff and nearshore competency is critical for IT leadership to satisfy the constant requirement to cut budgets without compromising service levels to the business. No longer is the question whether or not a firm should leverage capabilities external to the organization; in the current buy-side environment, utilizing a co-sourcing model to achieve cost savings within complex systems is a necessity. This past year, a large asset manager was faced with integrating systems from an acquired +$20 billion operation into their own environment. To support the acquired business, the firm needed to lift out a 20-application platform, comprised of off-the-shelf and custom developed technologies. The internal technology resources responsible for these applications were not migrating to the purchasing firm, presenting a challenge for knowledge transfer. The asset manager needed to extract the systems from the acquired organization, put them in place within the technology infrastructure of the existing firm, conduct a full knowledge transition, and provide ongoing development and support of these applications. A strategy was sought to provide transparency into the technology processes, high senior management control, and a reduced risk of operational disaster in integration, all while controlling costs. To this end, the firm considered three options – an in-house team; an offshore vendor; and a nearshore, co-sourced partner. The in-house solution posed several challenges; the manager needed to ramp up quickly, and identifying the talent within U.S. financial centers was difficult and extremely costly. Their second option was to utilize offshore vendors, who provide the firm with BPO and had offered technology services in the past; however, they previously had problems with resource quality, and had experienced a loss in productivity resulting from difficulties in communication. While the price per offshore resource was appealing, the team would need to be much larger than one based on onshore resources, and require careful supervision. Considering the mediocre success with such teams in the past, this option was rejected for such a high-stakes project. The final option was to identify vendors with whom they had success on smaller engagements in the past, and who could augment internal resources to allow the company to quickly scale up to meet the project needs without investing in expensive talent acquisition. To this end, the asset manager selected GFT, a nearshore, co-sourcing vendor with capabilities based out of Brazil. The nearshore, co-sourcing model resolves many of the biggest challenges presented by traditional offshoring, while providing increased cost savings and efficiencies over internal teams. With traditional offshore outsourcing providers, firms found that they had little transparency or control over the processes and technologies of their vendors, resulting in integration issues and misaligned expectations. Moreover, because of language and time zone differences, support was not as responsive as needed, thereby further depreciating its value. In response to these difficulties, firms turned their interest towards nearshore vendors that operate out of countries that lay between the traditional offshore development centers and global financial centers. These vendors operate in the firm’s local time zone and language, are able to have regular face-to-face sessions with internal resources (made possible by their close proximity), and act as a virtual extension of the firm’s organization. 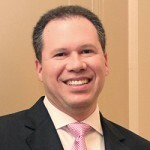 This new co-sourcing model, which utilizes a combination of onsite, onshore, and nearshore resources to augment a firm’s existing technologies and processes, allows firms to continue using their bespoke technologies, retain control and transparency over operations, and benefit from the lowered costs offered by outsourcing vendors. Leveraging a 12-person co-sourced team, the asset manager was able to successfully complete the migration process inside the planned timeframe of eight months. Support for these platforms was migrated to the nearshore team, allowing the asset manager to move on to the second phase – integrating these systems into the larger technology stack of the firm. No longer is employing a combined internal/external resource strategy reserved for innovators within the asset management space; the early adopters have proved this business model to provide superior cost savings and efficiencies, and a comprehensive co-sourcing strategy has become the new normal. As co-sourcing in the buy-side community moves towards its rapid growth stage, financial services institutions are beginning to find themselves in reactive, rather than proactive positions. Now is the time for asset managers to identify nearshore partners that provide the best strategic fit, before being outpaced by the industry. This article was printed in the Spring Issue of Global Custodian. Download a PDF of the article here.